One of Finland’s most maniacal and depraved three pieces, Bonehunter, has been steadily injecting the masses with gnarly, filthy metal for the better part of a decade. Though they were little noticed until their debut full length, 2015’s Evil Triumphs Again, the band has since been on a tear, unleashing sonic torment on unsuspecting ears. The band’s sophomore album, 2017’s Sexual Panic Human Machine was an utterly mental, depraved exercise in blackened, thrashing, gutter-drenched metalpunk (which wound up being one of my favorite albums of that year). 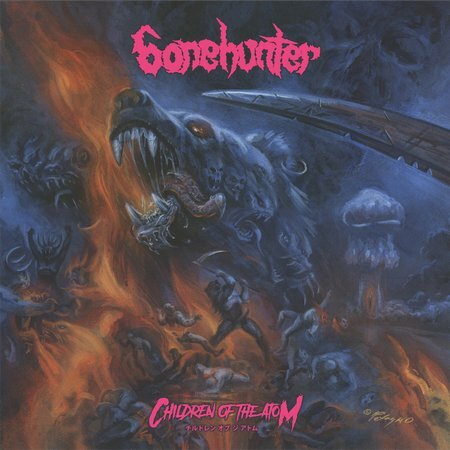 Just a mere thirteen months later, Bonehunter (dis)graces the world with another chunk of clashing, thrashing decrepitude, Children of the Atom. The latest effort sees Bonehunter further refining their instrumentation and, once again, stepping up the production values. The band still delivers an abominable dose of speeding, blackened thrash, though the punk influence seems significantly toned down, replaced by a ferocious increase of early death thrash in the mix. The resulting mass is crunchy and crushing with nonstop catchy riffs and hooks that throw back to the glory days when death, thrash, and black metal all came from the same boiling inferno. Despite how well the punk nods worked with the band’s early material, one will find the tracks here more potent and more violent in their absence. A bed of double bass and frequent dips into d-beat provides a background for the depraved thrashing, a handful rollicking bursts of Motö-rocking speed metal, and a strong leaning towards the masters of the first wave. Bonehunter has been historically known for proudly displaying some type of hominid bear with a constantly erect member, so it was a little surprising to see this was incorporated a little more, shall we say, tastefully, by master cover artist Joe Petagno. The previously mentioned werebear still shows off his package, though he’s busy, fiercely decapitating a huge swath of people. It should be noted that the large bear face to the upper left has a strangely phallic tongue and the mushroom cloud of nuclear destruction looks oddly similar to a mushroom head. Regardless of cover art, Children of the Atom is the band’s strongest, most polished work to date; it just coincidentally happens to be less a fusion of metal and punk and more of an unabashedly candid loveletter to the filthiest and sleaziest of the first wave. This entry was posted in Black Metal, Death Metal, Reviews, Thrash Metal and tagged bathory, black metal, Bonehunter, Children of the Atom, Cult of Horror, Death Metal, Hellhammer, Hells Headbangers Records, Possessed, punk, Sodom, Speed Metal, Thrash Metal, Venom, Whipstriker.